The Automatic Kinetic Theatre draws its inspiration from the ancient Greek Mobile Theatres. The project wishes to foster the dissemination of theatrical cultures across multilingual educational communities worldwide toward the materialization of a collaborative theatrical play. 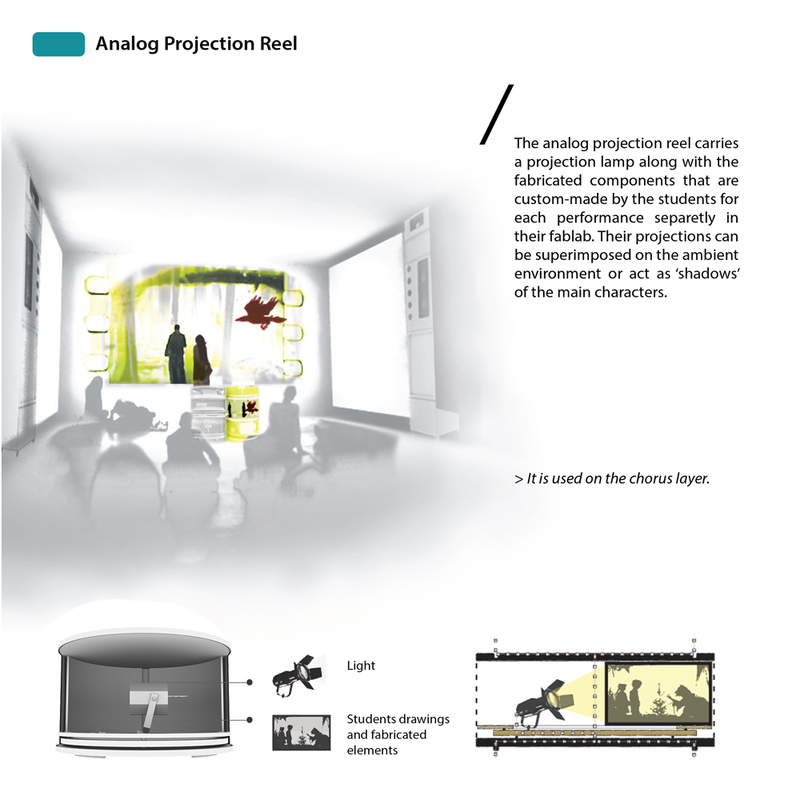 The project’s primary aim is to provide those communities with the techno-spatial knowhow and the tools to synchronously e-direct and asynchronously play a theatrical performance, using a hybrid multimedia platform, supported by the infrastructure of a transformable theatrical space. 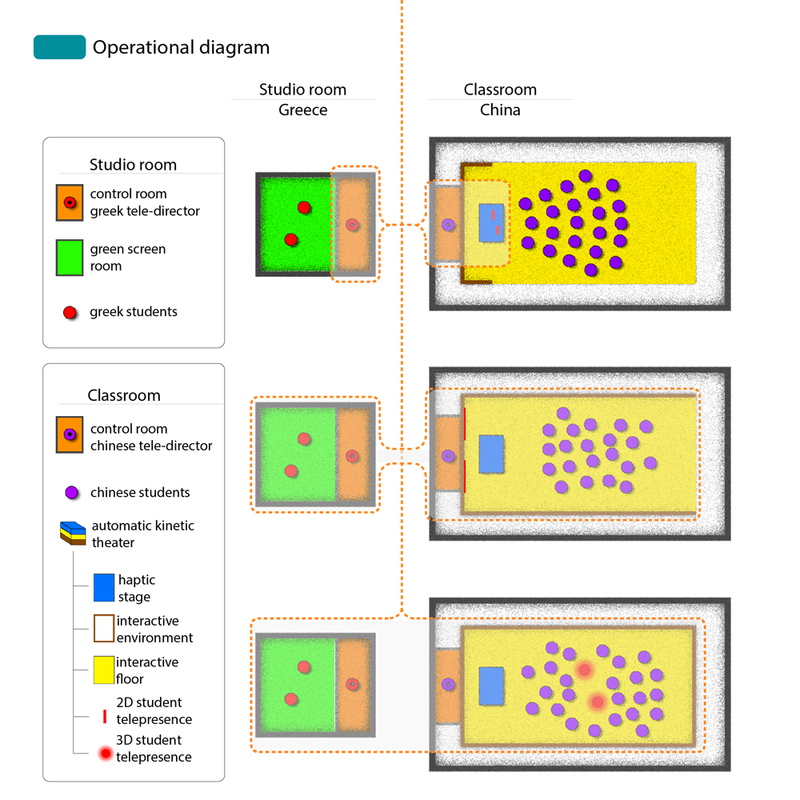 Students engaged with this project will have the ability to plan the spatial arrangements of the stage, the actors’ performance as well as the audience’s reaction according to a variety of theatrical traditions, like the ancient Greek semi-circular theater, the Elizabethan Theater, the Chinese Empire Theater and so on. Structural framework: These are the basic elements needed to build the standard Automatic Kinetic Theatre’s structure ensuring its stability, transportability and deployment on the selected site. It is comprised of stable parts upon which two types of kinetic elements are adjusted: those that provide the structure with additional adaptability and stability within spaces of diverse characteristics and those that transform the stage’s characteristics between different scenarios. The mechanisms employed are also attached here. The structural framework is made of wood and specific metal and plastic pieces. Receptors: These are the customized "pockets" upon which all the extra spatial and digital elements are adjusted. They form the necessary infrastructure that supports the performance’s interface and guarantees its uniqueness. During the pilot phase, the receptors will be designed to support the equipment of two passive levels and one active. They will be formed by elements of transformable geometry, made by customized 3d printed wooden and plastic pieces. Active performance elements - Interface: This part is the most essential one in terms of holding the performance, the director and the audience together by achieving targeted programmed reactions. In the pilot phase, there will be a small number of such elements exhibiting a behavior representative to the whole. Electronic equipment and mechanisms: This is the heart of the functional as well as of the communicative part of the project. It is a combination of sensors for activity detection, of controllers for data management (UNO by Arduino) and of actuators (small servo and stepper devices, LED lighting, microphones and so on), applied in any of the aforementioned parts at the will of the director. The pilot phase will include a small number of representative such parts. Software: This constitutes the system’s brain. During the pilot phase studies will determine the research direction and the methodological approach. Its final development will take place during the second phase.